Super-low-noise-figure receivers are absolutely essential in radio astronomy work. The need has driven major advances in the state of the art of cryogenically cooled front ends with noise temperatures near absolute zero. Antenna technology has also benefitted from radio astronomy due to the need for precision steering and narrow beam widths. Phased arrays (aka interferometers) for interstellar targets requires that element spacing be large enough to require separate antennas as the elements, which creates a very large effective aperture, hence greater angular resolution. Networks located continents apart are synchronized with the use of atomic clocks to allow signal time of arrival and therefore phase to be accurately measured. This story gives some of the early efforts. Astronomers are using new tools and techniques to provide the answers to some age-old riddles of the universe. Fig. 1. 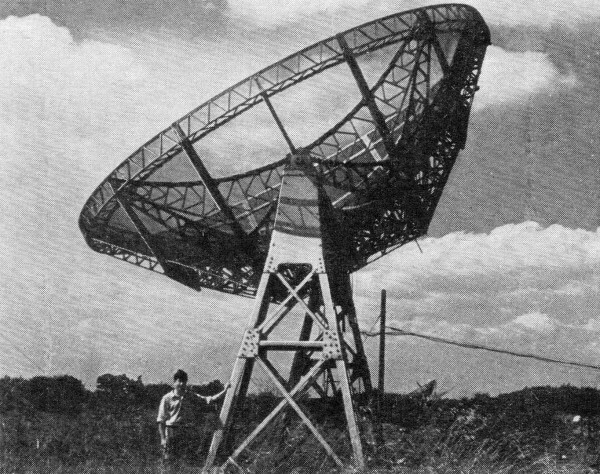 One of the parabolic reflectors being used with the interferometer now in operation at Cambridge, England (right). In 1942 radar operators in England began to report a new kind of jamming observed on their meter-wave­length receivers. Weak radar echoes became lost in the "grass" on the (radar) screen, as if swamped by "noise" from a powerful transmitter. In the Army Operational Group, a scientist named J. S. Hey - later to be known as one of the pioneers of the new science of radio astronomy - examined the reports. He established that the source of the "jamming" was no enemy station, but the sun, and he noticed that at that time an exceptionally large sunspot was crossing the sun's face. Radio amateurs can detect this radiation from the sun during periods of sunspot activity, and even television screens are affected by it, but few people know that the sun and some other celestial objects are radiating short radio waves continuously. The first observations of this steady radiation were made in 1932 by an American radio engineer, Jansky, who was investigating the level of noise picked up by a sensitive receiver on a frequency of 20 mc. He found that a directional antenna gave a greater noise signal when pointing at the constellation of Sagittarius, in the brightest part of the Milky Way, than in directions away from this high concentration of stars. 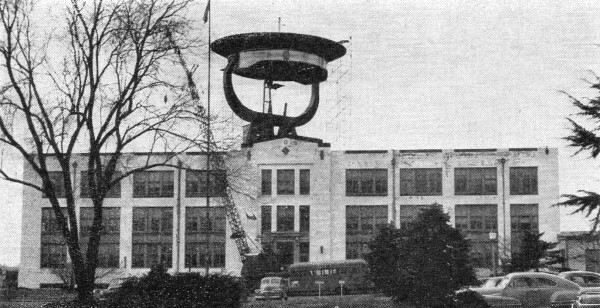 Ten years later, a radio amateur, Reber, built a parabolic reflector antenna 30 feet in diameter, in his own yard, and used this to make a map of received signal strength on frequencies up to 500 mc. over a large part of the sky. Fig. 2. Array of full-wave dipoles at 3.7 meters. This array is one-half of an interferometer for detecting radio stars. See text for full details. The 600-inch "radio telescope" installation at the Naval Research Laboratory which is being used to study radio "signals" from the sun, moon, and stars. Scientists use this research tool to extend man's knowledge of the universe and to assist in forecasting the conditions for radio communications work. Fig. 3. 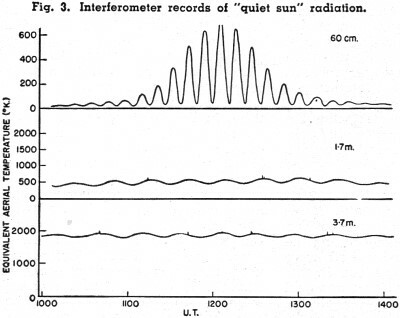 Interferometer records of "quiet sun" radiation. Fig. 4. Part of interferometer recording showing the presence of several of the minor "radio stars." Fig. 5. Section of record with high sensitivity showing intense source in Cassiopeia. See text for details. Fig. 6. (A) How two similar antennas, spaced several wavelengths apart, are used to detect radiation from the sun. (B) Use of a phase-sensitive detector to eliminate receiver noise. (C) Improved version of the circuit shown in (B) in which the antenna noise is continuously compared with the noise generated from a controllable local source. a noise diode. (D) A pair of antennas connected in a radio interferometer with a device for reversing phase of the signal from one antenna periodically. Fig. 7. Parabolic reflectors used in an interferometer for accurate direction finding. Then came one of the most startling discoveries, again first hinted at by J. S. Hey. 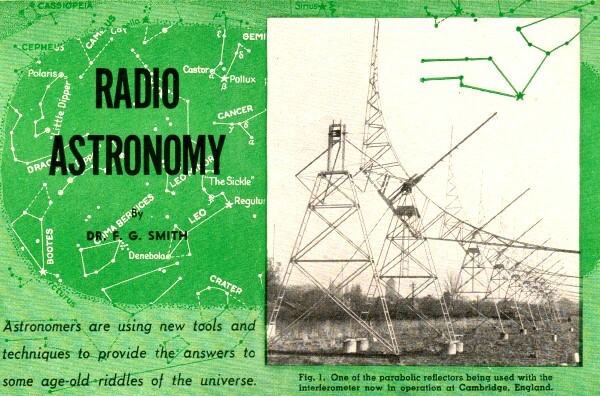 Workers in Australia and England found that the radio waves picked up by Jansky and Reber came, not only from the Milky Way but also from some quite definite points in the sky, as though individual stars were transmitting to us. But there were no bright stars at these points, and it was not until 1952 that these "radio stars" were identified with visible objects in the sky; even then the objects were so faint and inconspicuous that it needed the 200-inch Hale telescope at Mt. Palomar to find them. Many astronomers have become interested in this new science as an extension of astronomical techniques, and radio-astronomy is now being put to use in many parts of the world extending our knowledge of the solar corona, interstellar gas, nebulae, and even of our own ionosphere. In this article we shall be concerned less with the results than with the methods, since the problems of technique are of great interest and are not well known. The two main problems facing the radio-astronomer wishing to study radio waves from some object or region in the sky are simply stated. First, the power available in his antenna is usually not greater than about 10-16 watt. Second, the beam width of his antenna is usually vastly greater than the angular size of the object, and the radiation picked up may well have come from many other objects in this region. Both these difficulties, of signal strength and resolving power, clearly call for large antenna systems and the radio astronomers are, in fact, building large antennas for this work. In Manchester, England, there is now under construction a very remarkable parabolic reflector antenna. This will be 250 feet in diameter, and it will be so mounted that it can be directed towards any part of the sky. The reflector will be made of wire mesh, and the accuracy of its surface will be such that it can be used on wavelengths as short as a half meter or less. But many observations can be made with much smaller antennas by using the principle of the radio interferometer. If two similar antennas spaced several wavelengths apart and both directed towards the sun, are connected to the same receiver, as in Fig. 6A, it is possible to distinguish the radiation received from the sun against a background of radio waves from the stars behind it, although this background may be several times more intense than the solar radiation. 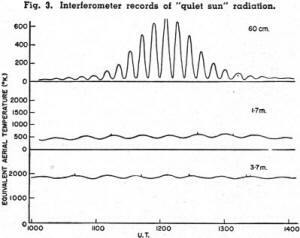 The records of total power received from such a radio interferometer as the sun moves slowly across the sky would be like those in Fig. 3, showing some actual records on various wavelengths. In each the sinusoidal variation of signal is due to the sun passing in and out of the interference zones of the spaced antennas, whereas the steady signal, most evident on the longer wavelengths, is from the extended source of the Milky Way background. An improved method of recording recently used makes a record of only the sinusoidally varying signal, giving the intensity of the solar radiation without any confusion from the background radiation. The method of achieving this, known as phase-switching, will be described after we have examined more closely the problem of detecting these exceedingly small signals. The character of the signals received from the sun and the stars is exactly the same as that of "receiver noise." 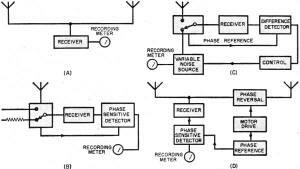 If we connect the input of a receiver first to an antenna and then to a dummy load, the difference in signal may be demonstrated as a change in the output of a detector circuit, but this change may be only a few percent of the output, most of which is due to the receiver noise. 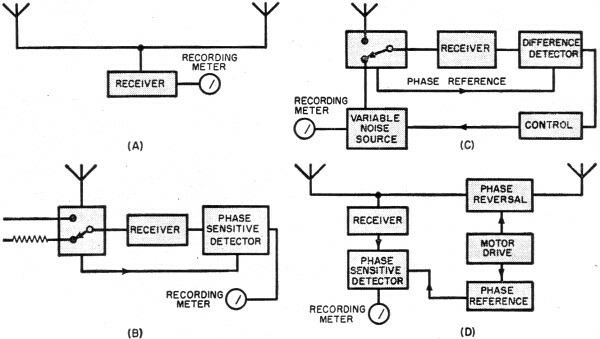 It is necessary to record this difference without including receiver noise, and this is achieved in the schematic of Fig. 6B. The use of a phase-sensitive detector enables a long time constant to be used in the output circuit, and the smoothed output records the difference between the two levels of noise. An improvement is again made in Fig. 6C, where the antenna noise is continuously compared with the noise generated in a controllable local source, in practice, a noise diode. The output from the local source is automatically adjusted to equality with the antenna noise, and a record of the current in the diode gives a direct record of antenna noise unaffected by the characteristics of the receiver. The records in Fig. 3 were made in this way. These methods of detecting small noise signals have been widely used in the measurement of the total noise power received at an antenna. But in radio astronomy it is often necessary to select only that part of the noise which is coming from a small source in the sky, perhaps a radio star or a sunspot, and to disregard a large proportion coming from a diffuse background of other sources. A new method of detection is then used. In the schematic of Fig. 6D a pair of antennas is connected in a radio interferometer with a device for reversing the phase of the signal from one antenna periodically. The lobes of the interferometer radiation pattern then shift by a half lobe width, due to the phase shift, and the signal from a source smaller than the lobes of this pattern will change periodically by an amount depending on its position in the pattern. Again a phase-sensitive detector is used to measure this periodic change in output. In Fig. 4 we see the recorded output of such a phase-switching receiver connected to a large interferometer operating at a wavelength of 3.7 meters, shown in Fig. 2. The output is centered on zero, and the groups of oscillations each record the passage of a radio star through the antenna receptivity pattern as the earth rotates. This method of recording radio stars has been used in the accurate location of some of the most intense radio stars. A record from the intense radio star in Cassiopeia using part of the same interferometer is shown in Fig. 5. The interferometer in Fig. 2 is located along an east-west line so that each radio star is detected as it crosses the meridian, a line from the zenith to the south point. The time of this crossing, found from the record, gives the position of the star in the sky. The timing may often be carried out to an accuracy of about 0.1 second, but unfortunately the actual position of the star cannot be determined quite as accurately as this. For one thing, the position of the interferometer axis must be known, and with the antennas of Fig. 2 this cannot be defined to better than about 2 minutes of arc. The interferometer in Fig. 7 was specially built for such work, and the line joining the bearings of the two parabolic reflectors was determined to 10 seconds of arc. 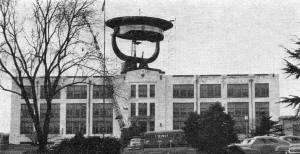 These reflectors are two of the antennas of the "Wurzburg" radar set much used by the Germans during the war. They are 27 feet in diameter, and the two are mounted 900 feet apart, 200 wavelengths at 1.4 meters, the wavelength used in the most accurate direction finding experiment yet made. With this interferometer, a radio star in the constellation of Cassiopeia was located within an area only 10 seconds by 30 seconds of arc. The position was given to astronomers at Mt. Palomar, who found with the 200-inch telescope a new type of nebula exactly in the right place. This new branch of science is certainly providing new tools for the astronomer in his survey of the heavens, but it may also prove to be a useful approach to some studies of the ionosphere. When Hey first detected radiation from a radio star, he distinguished it from the background because the signal was fluctuating in a peculiar way. This effect we now know to be very similar to the scintillation, or "twinkling," of ordinary stars. It is caused by refraction in irregularities in the earth's ionosphere, through which the radio waves pass, and by studying the fluctuations in signal it has been found that the irregularities are in the upper part of the F-region, inaccessible to pulse-sounding methods. It appears that the top of the F-region occasionally becomes corrugated, to an extent of about one percent of its total depth, the wavelength of the corrugations being about 5 km. The whole structure is drifting across the earth at a speed of several hundred miles-per-hour, and the effect on the ground is similar to the moving pattern of sunlight on the bottom of a swimming pool when waves disturb the surface. The cause of this ionospheric disturbance is still unknown. Another useful way of investigating the ionosphere has been suggested. As the radio waves from a radio star pass through the ionosphere they may be refracted in such a way as to make the star appear in the wrong position. The amount of this displacement may be measured, and depends primarily on the total number of electrons in a vertical column right through the ionosphere. Pulse-sounding methods are not suitable for this measurement, and it is likely that understanding of the ionosphere, still full of mysteries, will be helped by these new experiments. The most exciting discoveries of radio astronomy have been in the search for sources of radio waves in our galaxy and in extragalactic nebulae, and this search is being pursued with great vigor in several places. The new Manchester antenna will be used in this work. Recently some details were published on a new antenna1 at the Ohio State University designed to carryon the search. There is, however, a large interferometer antenna now in operation at Cambridge, England, which may well be called the largest radio-telescope in the world. Its parabolic reflectors cover an area close to 50,000 square feet. Results from a survey of radio sources in the Northern sky should be available in a few months' time. No description of this instrument has yet been published, and a picture of one of the reflectors in Fig. 1 is the only one available as yet. 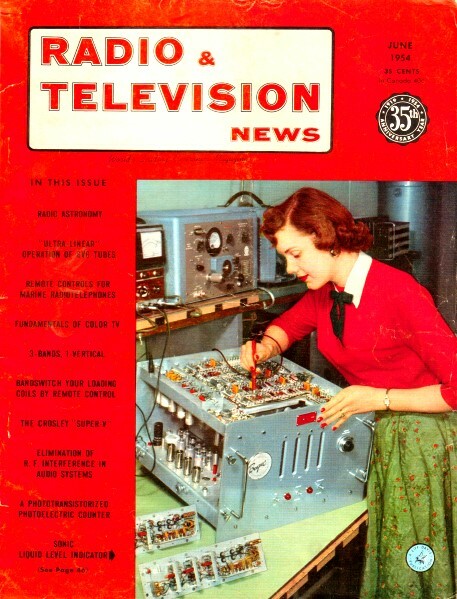 It is hoped that this instrument will provide some further clues to the solutions of the great problems "What are radio stars? "; "How many are there in our galaxy? "; "Do other galaxies have radio stars like ours ?" - questions we may hope to have answered in only a few years from now.